GLASSLINED TANK (SPECIAL COATING ON TANK), SUITABLE FOR HIGH RISE BUILDING (5 YEAR WARRANTY). BEE APPROVED 5 STAR RATED MINIMIZE YOUR ELECTRICITY, BIS APPROVED ISI SPECIFICATION ON EMEMENT TO ENSURE THE LASTING LIFE. SPECIAL ANTI RUST COATING ON TANK AND GEYSER TO SAVE IT FROM RUST OF CORROSION(FOR LASTING LIFE). EXTRA ELEMENT FOR EXTRA HEATING AND DURABILITY AND THERMOSTAT TO PREVENT FROM OVER HEATING. 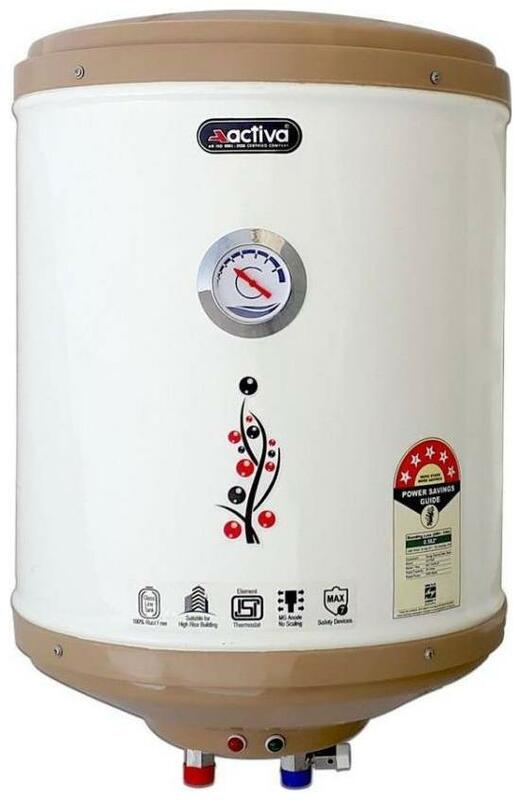 The Activa amazon glassline water heaters is a highly energy efficient 5 star rated water heater that is perfect for all your water heating needs and suitable for high rise buildings. With a 15 L capacity glass lined tank it stores enough hot water for a refreshing bath at a water temperature also provide complete 15 ltr hot water (geyser water heater technology).